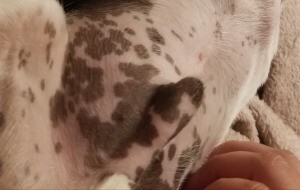 What Are These Colored Markings on Dog's Tummy? My pup developed these. What are they? If you see any changes in your dogs skin, you should ask the vet. Dogs get lumps and bumps. Usually they are nothing, but they ALWAYS need to be checked by a vet to be sure. If you have an established relationship, they may allow you to send the pictures to them for a free consultation. Some do that. Prayers that it is nothing! !